Given the tireless efforts of small-press publishers to get vintage pulp fiction back into print over the last decade, I often wondered why L. Patrick Greene’s Africa-based adventure stories had been overlooked. 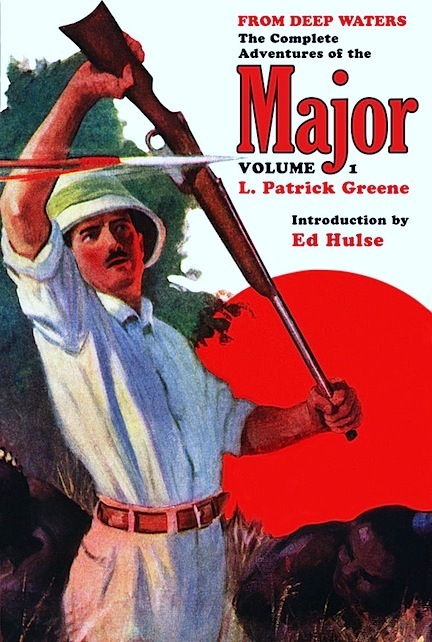 From 1919 until 1947 (with six years off for World War II service) Greene chronicled the exploits of Aubrey St. John Major, who started out as a charming rogue but evolved into a knight errant. The Major’s bailiwick was South Africa’s Transvaal region, although some adventures took him to other parts of the continent. Accompanied by his faithful native manservant, Jim the Hottentot, the Major matched wits with gun runners, white slavers, diamond smugglers, international spies, and assorted criminals of every stripe and nationality. He often operated outside the law — especially during the early years of his career — but always served the cause of justice. Created for the venerable rough-paper magazine Adventure, the Major most frequently appeared in Short Stories, published by Doubleday until 1937 and afterward by erstwhile shoe manufacturer William J. Delaney. The series included approximately one hundred stories of varying lengths, and the Major was among the relatively few characters mentioned by name on Short Stories covers. Some 19 collections of Major yarns were reprinted between hard covers here and abroad, but those books have been out of print for many decades. Happily, the indefatigable Matt Moring has chosen to bring the series back into print under the auspices of his Altus Press. Matt is presenting the stories in the order in which they were originally published, with the first volume (a cover scan to which is included below) tentatively scheduled for release sometime next month. I’m honored that he asked me to write an introduction to the series, because the Major is one of my favorite pulp-magazine characters and I believe he’s long overdue for rediscovery.